Meal prep is pretty much as trendy as chokers and mom jeans these days and for good reason, too. What if I told you it's one of the most effective ways to lose weight and it doesn't have to be time consuming either? Intrigued? Thought so. Try these quick and easy vegan recipes that'll turn you into a meal-prepping machine quicker than you can say 'meat free'. How many times have you sat and wondered what it would like to be vegan but been put off by little niggles in your head stopping you? From the fear of not knowing where to begin with meals, to having to cut out so much that you're left feeling hangry all of the time - let me tell you that such fears are nothing more than a myth. There are many health benefits to tempt you into trialling a plant-based and meat-free life. We spoke to SuperfoodUK nutritionist Shona Wilkinson who gave us the down low on making the switch. She told us: "Excluding animal foods can mean consuming more of the all-important vegetables and fruits which, as well as providing vitamins and minerals, are excellent sources of a wide assortment of antioxidants that can help to protect our cells and tissues and have been found to have a role in supporting our immune system. ''Most plant foods are also good sources of fibre which supports digestive health and balances cholesterol levels. There may be benefits to the ‘alkalinity’ of a vegan diet. This is based on the theory that the food we eat can affect the pH balance of our blood which can in turn affect our health. Foods thought to promote excess acidity in the blood include meat, dairy, sugar, refined carbohydrates and coffee. "High blood acidity as a result of this type of diet is said to be linked to poor health and increased risk of degenerative diseases. Conversely, foods that are thought to promote alkalinity are mainly vegetables (especially green vegetables) and fruits, as well as some whole grains, nuts, seeds and pulses – in other words, non-refined plant foods that should be the basis of a healthy vegan diet. "The benefits are gained from eating whole foods; refined produce such as white breads, white pasta and white rice, sugar and sugary foods can be suitable for vegans but will not have all these benefits and are generally best avoided." So how can you improve your chances of sticking to a vegan diet? You've got enough health-beneficial-based facts to convince you to try living like a vegan and you're ready to give the their diet a go, but how can you make sure you stick to it? Holland & Barrett’s resident nutritionist, Elizabeth Wall, says the key is all in the prep. She told us: "When you embark on a vegan diet you are effectively removing several major food groups from your diet. If you choose to follow a vegan diet and want to stick to it exclusively you’d be wise to replace your staples with vegan products from the start so that you minimise your risk of tucking into dairy or meat produce. Preparing lunch and snacks at home will also help ensure that you always have something suitable to eat as you adjust to your new diet." Now you know what you can and can't eat, it's time to transform all that plant goodness into some drool-worthy meals to help you on your quest to becoming a fully-fledged vegan - even if for only a temporary period. ​We've searched high and low to find the best - i.e. the tastiest and easiest - vegan meal-prep ideas to spark your imagination and ensure you stick to your new lifestyle choice with ease - tuppawares at the ready. If you love to indulge in a ruby murray every now and then, going vegan in no way means you have to wave goodbye to curry altogether. This meat-free alternative is just as yummy as your go-to chicken korma and will give you way less bloat, too. Mexican food fans this is sure to tickle your sombrero. A modern take on the classic enchilada, this yummy concotion is rich without the guilt. You can whip these up from ingredients already in your cupboard, meaning more bean for your buck. Is there anything better to warm you up than a hearty soup? Granted, a snuggle by the fire with Ryan Gosling would suffice, but this healthy soup is the next best thing, promise. Tip: use butternut squash instead of the sweet potato if that's more your bag. Get your soup fix here. If you think going vegan means going cold turkey on your pasta penchant, relax! You can still gorge on the good stuff, it's just about swapping it for a vegan-friendly alternative. Cook enough of this beetroot-stuffed recipe and your carb cravings will be satisfied for the whole week. Nothing warms your cockles quite like a tasty stew, right? And FYI if you're becoming vegan, chickpeas are an ingredient you'll become very familiar with so fill your basket next time you're food shopping. While kale may remind you of flat lays on Instagram, there's a reason for its popularity among the oil crowd and that's because it's hella good for you. High in iron, vitamin K & A and full of antioxidants, it's a vital part of a vegan diet - embrace your inner basic b*tch and chow down! Get the step-by-step details here. Make extra portions of this around Halloween - you're gonna have to put those insides to good use after scooping out your trumpkin after all. Get your fix of the orange-seeded delight in the form of this yummy comfort meal here. Packed lunches may bring back memories of a Moomin lunchbox filled with nothing more than soggy Dairylea dunkers and a Frube, but let me tell you that this grown up packed lunch is anything but drab. Read the yummy recipe here. However you like them in the morning, that egg habit can be hard to break. But as far as vegan alternatives go, this is up there with the best. Bursting with flavour, this chick pea brekkie packs a punch and will keep you full 'til 11am. Find the easy peasy recipe here. 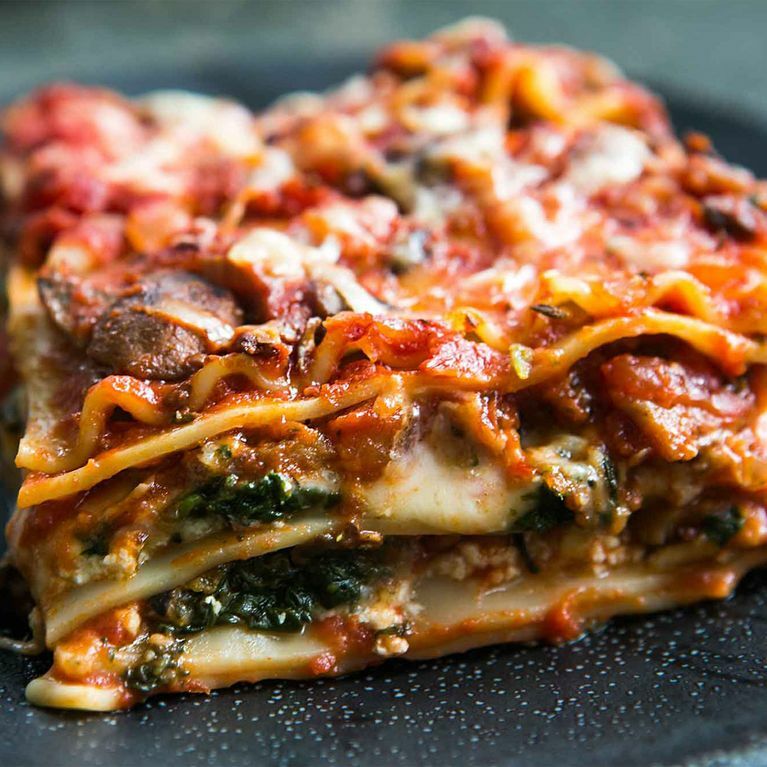 Going vegan doesn't mean you have to give up your beloved lasagne habit, it does however, mean you have to replace the cheese with cashews, and swap the traditional béchamel sauce for a celeriac version. But bear with me here because it still tastes pretty freakin' good and that's coming from a self-confessed cheese addict. Everybody knows that pizza is life, heck we're even getting under cuts in ode to the dough, but traditional pizzas are off the vegan menu I'm afraid folks. But before you start blubbing, imagining life without the crust, stop right there because this vegan calzone complete with vegan cheese will more than satisfy your cravings. While you could pack these lunchtime saviours into the obvious option of a burger bun; you could also stuff these babies into wraps, salads or just a plain old sandwich loaf if that's what you've got at home. Find the simple recipe here. We may still not be able to pronounce it correctly, but quinoa isn't going anywhere anytime soon. Packed with almost twice as much fibre as most other grains, and rich in lysine and magnesium, it's easy to see why it's become such a buzzword. Find out to make it here. Cook a vat of this Sunday evening and that's lunch sorted for the week - meaning you can save your dollar for the Topshop sale. This casserole might have a little more than five ingredients, but it only takes ten minutes to whip up and is packed with protein, keeping you fuller for longer. This hearty stew uses tender portobello mushrooms in place of the meat, but don't for a second think equals you feeling hungry because the mix of potatoes, veggies and red wine broth will more than stop your belly rumbling. Satisfy your cravings for carbs with this meal which can be enjoyed hot or cold, perfect for when the office microwave breaks for the hundredth time. You can't beat a huge slice of fluffy shepherds pie, and being vegan in no way means you have to part ways with this classic. This recipe is a doddle, find it here. Yes you read that right; a vegan meal prep recipe that includes cheese. CHEESE. HUZZAH! While it may not quite be the dairy-tastic variety you're used to, as far as dupes go this is as good as a really good high street Gucci handbag. Avocado queens this one's for you: you've already had the glorious, green fruit smashed, diced and sliced so why not take it next level and mix it into this healthy recipe for a change, eh? Get your avocado fix with the recipe here. These little beauties will make a quick, tasty meal any day of the week. The sour cream is made with cashews to replace the dairy and we promise we won't judge you on how big your guacamole dollop is either. Peppers have to be one of the most versatile veg of them all. Fry 'em, eat them raw, or stuff 'em full of quinoa goodness following this recipe. FYI if you're more partial to a red or green variety, they also work just as well. Get your teeth around this super quick and yummy soup and you'll never go back to the tinned variety you lived on during your university years ever again. Get the yummy recipe here. It's just a fact that the best things come in ball form - get your mind out of the gutter now, I'm not talking about those kinds of balls but the chocolate kind, Malteasers obviously. These falafel balls further certify that fact - and the proof is in my empty bowl. A stew is for life, not just for winter. Keep this one in your collection and the quantity you make is entirely up to you. Enjoy on its own or with some healthy wholegrain rice, couscous or even your good friend quinoa.